In this pAsuram, mAmunigaL is following AzhwAr’s pAsurams of instructing others saying “Taking refuge of thirumalai (the sacred thirumAlirunjOlai hill) is the means for the goal” and is mercifully explaining it. Alternatively it can be said that mAmunigaL is explaining how AzhwAr is enjoying thirumAlirunjOlai as the ultimate goal. How is that done? While AzhwAr was determining his own goal in thiruvAimozhi 2.9 “emmA vIdu“, he was greatly craving for it saying “ollai” (quick) repeatedly; understanding AzhwAr’s urge, emperumAn revealed his presence in southern thirumalai (thirumAlirunjOlai, the sacred hill) so that AzhwAr can enjoy him in this world itself with his present body; AzhwAr meditated upon this and thought “more than emperumAn himself, the divine hill which is his dear abode, is apt for us to pursue”, enjoys thirumalai AzhwAr (the divine hill) with great affection, becomes pleased and instructs the samsAris (materialistic people) also to take refuge there in thiruvAimozhi 2.10 “kiLaroLi iLamai“; mAmunigaL mercifully explains this starting with “kiLaroLi sEr“. To attain the previously explained purushArtham which is having radiance, AzhwAr mercifully said to reach thirumAlirunjOlai which is the residence of emperumAn who has growing radiance, with our heart, without getting tired; we will place our head in front of the divine feet of the greatly glorious AzhwAr. kiLar oLi sEr kIzh uraiththa pERu kidaikka – To attain the greatly radiant goal which was spoken about in previous decad “emmA vIdu“. thaLarvu aRavE nenjai vaiththuch chErum enum – would mercifully say “without the fatigue of not thinking about bhagavAn, place your mind on thirumalai which is his residence and take refuge of it”. aRavE – Without such weakness, for the goal as said in thiruvAimozhi 2.9.1 “pAdhapaRpu” (lotus feet), he ordains “thennan uyar poruppu” (the high mountain of thennan, the king, periya thirumadal) as the means. As it is said in thiruviruththam 31 “van thAL simayam” (mountain having very strong foot), it has sufficient base to give refuge. Saying as in thiruvAimozhi 3.3.7 “saman koL vIdu tharum thadangunRamE” (the divine hill which gives liberation). nenjai vaiththuch chErum enum – The source for this phrase is the first pAsuram “kiLar oLi iLamai“. It was mercifully explained as “before the faith in mind changes”. It is said in mUnRAm thiruvandhAdhi 94 “uyththuNarvennum oLi koL viLakku” (radiant lamp of knowledge which is readily available). sErum is primarily as per AzhwAr‘s merciful explanation in “kiLar oLi iLamai keduvadhan munnam” (before losing youthfulness) [1st pAsuram] up to “pOdhavizh malaiyE puguvadhu poruLE” (entering the flower blossoming mountain is the goal) [10th pAsuram]. That is, as said in “sArvadhu sadhirE” (it is best to reach the mountain) [1st pAsuram], “ayan malai adaivadhu adhu karumamE” (reaching a mountain near thirumalai is a natural activity [for the AthmA] and must be done) [3rd pAsuram], “thirumalai adhuvE adaivadhu thiRamE” (to reach that thirumalai itself is that which is to be done) [4th pAsuram], “neRipada adhuvE ninaivadhu nalamE” (to meditate upon entering the path to such thirumalai is the goal) [6th pAsuram]. Also, as said in SrI rAmAyaNam ayOdhyA kANdam 113.3 “pradhakshiNam cha kurvANaSchithrakUtam mahAgirim” (They circumambulated the great chithrakUta mountain), AzhwAr said “valam seydhu nALum maruvudhal vazhakkE” (engage in favourable acts such as circumambulation etc ) [8th pAsuram], “thozhak karudhuvadhE thiNivadhu sUdhE” (have full faith in the mind to worship such thirumalai) [9th pAsuram]. AzhwAr enjoyed thirumalai, the hill which was attached to it, the neighbouring mountain, the dhivyadhESam, the path which leads to the hill and the firm faith to go there, and considered them all as part of the goal, and instructed the same to others. All of these are explained in this pAsuram by mAmunigaL. nAyanAr explained the sacred hill in the context of upAyam (means) in AchArya hrudhayam “anthargatha guNOpasAnaththai madhiththup perukki mUzhgi azhum kIzhmai valam sUdhu seydhu iLamai kedAmal seyyum kshEthra vAsa sankIrthana anjali pradhakshiNa gathi chinthanAdhi angamAkkugiRAr iraNdAm paththil“. Hence, thirumalai can be explained as both means and goal. nenjai vaiththuch chErum enum nIdu pugazh mARan thAL – As AzhwAr gives instructions seeing the suffering of others, his glory increases forever and is ever lasting; on such AzhwAr’s divine feet. mun seluththuvOm em mudi – Let us work to place our head in front of his divine feet. It is said in AzhwAr‘s thaniyan “SrImath thadhangri yugaLam praNamAmi mUrdhnA” (everything is nammAzhwAr’s divine feet for us, and we hold his divine lotus feet on our head) – now all we need to do is to know his divine feet. Alternatively it is explained as – before AzhwAr’s divine feet comes and touches our head, we should direct our head towards his divine feet. 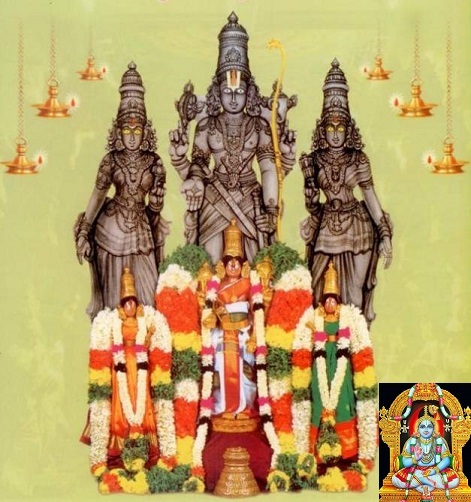 This entry was posted in Other, thiruvAimozhi nURRandhAdhi on December 17, 2018 by Sarathy Thothathri.